Recently I have found myself complaining to friends, usually over coffee at the BEL Faculty’s RooftopCafe, that the current communications strategy of the Federal Reserve’s Federal Open Market Committee has been confused and sometimes inconsistent. While they have been improving their strategy over time, recent significant increases in key interest rates in the US Treasuries market represents a policy tightening that was unintended and likely caused by inconsistent communication from the bank. When used correctly, a central banker’s words provide clarity and guidance to markets, as well as transparency to the process of macroeconomic management. When used incorrectly, they can provoke confusion, volatility in markets, and can undermine the effectiveness of monetary policy tools. For this post, I want to illustrate what effective central bank communication looks like and what it can achieve. I think the easiest way to do that is by staying close to home. The RBA is particularly proficient in the matter of communication of monetary policy (although to be fair to the FOMC, it’s much easier when interest rates are not close to zero). Good examples of central bank communication can be found in recent RBA minutes, as well as a Glenn Stevens speech at a Canberra luncheon on the 30th of July. The June minutes of the RBA’s monetary policy board note, “forward-looking indicators of labour demand were consistent with further moderate growth in employment” [emphasis added]. The July minutes note “forward-looking indicators of labour demand implied only modest growth in employment in the months ahead” [emphasis added]. The subtle shift, from ‘moderate’ to ‘only modest’, is the board communicating its recognition of tightening conditions in the labour market. In Stevens’ speech, not only does he emphasise that the Australian economy faces significant macroeconomic challenges in the near term (especially with respect to a fall in mining investment), he clearly states that the RBA has scope for further monetary easing, and that it will do so if required. He also mentions that with the mining boom abating the bank expects the dollar to fall, a sign that it sees more ‘passive easing’ from a fall in the exchange rate as appropriate. 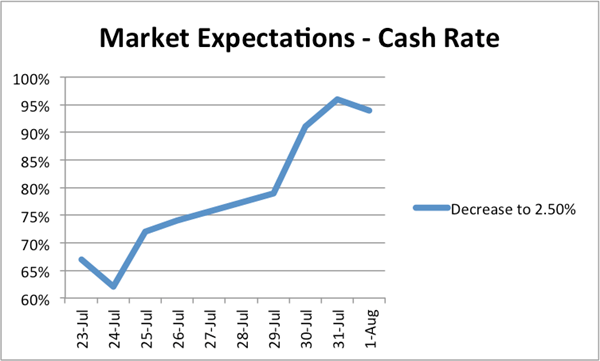 The governor’s dovish speech, as well as the shifting sentiment in the minutes, solidified market expectations of a cut in the August meeting. The Australian dollar dutifully followed suit, falling below 90 cents. Such an effective and clear communication strategy allows markets to ‘price-in’ monetary policy changes (lowering volatility on the day of an official announcement), and assures market participants that the central bank is committed to its mandate. The bank’s commitment to easing has no doubt been a factor in the softening exchange rate, which will support aggregate demand over time. As I said above, successful central bank communication is certainly easier when interest rates are far away from the zero lower bound. For this reason, the FOMC’s communication strategy is necessarily more complex than the RBA’s. The FOMC has used several different forms of forward guidance since the Federal Funds rate hit its floor of 0 to 25 basis points, and in the past year it has settled on something called the ‘Evans rule’, which I will examine in more detail in the next post. Nevertheless, Ben Bernanke’s recent testimony to Congress, excerpts from the FOMC’s monetary policy minutes, as well as continuous speculation by market participants about the timing of ‘tapering’ of the Fed’s bond purchase program has led to inadvertent tightening over the past few months. The 10-year US Treasury yield is more than 100 basis points higher than where it was a year ago, despite the FOMC’s commitment to continuing current policy changing little over that time. I hope to explore why this has happened, and explain the various forms of central bank communication at the zero lower bound in my next post.